Members are encouraged to demonstrate how they meet this requirement by either using the FORS spreadsheet template or by exporting the relevant staff’s training data using the new export function on the FORS Professional training register. 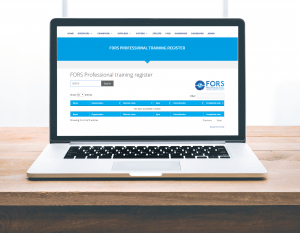 FORS-approved training will be listed in the FORS Professional training register. Training that is mandatory every 12 months or every five years will no longer show after the expiry date of the training has been reached. If using the FORS spreadsheet template, please ensure you provide the relevant staff details as they appear on the FORS Professional training register so that the information can be cross-referenced by the auditing team when reviewing your Silver application. FORS is encouraging use of this template to ensure that all aspects of the requirements are covered. However, companies using their own template which contains the same information will be accepted as evidence and should be uploaded in the usual way. The spreadsheet based template is available to download from the relevant section of the evidencing system or from the ‘Getting ready’ section of the Silver progression page. If you are exporting the data from the FORS Professional training register, please also provide an up-to-date list of current drivers so that the auditing team can check that all your current drivers meet this requirement. You will need to be logged in to export the data. Note that the training records held in the FORS Professional training register belong to the driver and if changes are required (eg a driver joins or leaves your company), only the driver has the right to get his/her record(s) amended. An email from the driver to the FORS Helpline will be sufficient.